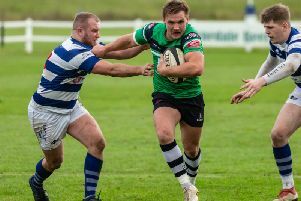 Preston Grasshoppers welcome Peterborough Lions to Lightfoot Green for the first time tomorrow – but fans will be hoping the welcome stops at the door of the changing rooms. 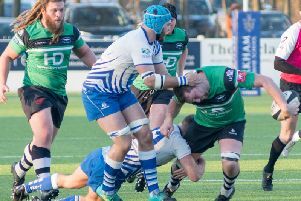 On paper, the Lions present Hoppers with one of their home ‘bankers’, as they are bottom of National League Two North with just one victory in their first 10 games at this level. But that win, oddly, came against high-flying Chester, so coach Paul Arnold’s men will be taking nothing for granted as they return to action after a weekend off. They know, too, that they face big challenges in the next couple of weeks, with fixtures against the clubs currently first and third in the league. Hoppers’ latest narrow defeat at Tynedale a fortnight ago dropped them back to 11th place, with three victories and seven defeats, but the mid-table field is still quite tightly bunched. Lock Adam Howard is back in the starting line-up, with Arnold on the bench, and Rouban Birch returns to the back row. There is a reshuffle in the backs due to Brad Cave being unavailable. Tyler Spence switches to full-back and Matt Crow makes his first start on the wing. Fylde, back up to eighth place after their fifth win out of 10 a fortnight ago, also have first-time visitors – in league fixtures at any rate – in the shape of South Leicester. The Midlanders, whose only previous trip to Fylde was for a cup-tie, lie third from bottom following three victories, a draw and six defeats. In the North Premier League, Vale of Lune head for Sandal for the first time in 25 years, as they continue to search for their first success of the campaign. A solitary draw, along with eight defeats, leaves them at the foot of the table, while tomorrow’s hosts are fifth after five victories and four defeats. Vale have Jonty Higgin back in the centre, with Damon Hall moving out to the wing. Prop Ross Pillow returns from holiday and Jack Turton is at fly-half. There will be a late decision between Chris Ramwell and Jordan Dorrington for the full-back berth. Hoppers: Spence; Trueman, Stott, Fitzpatrick, Crow; Davidson, Gough; Mabaya, Millea, Altham, Procter, Howard, Murray, Birch, Lamprey. Replacements: Miller, Arnold, Trippier, Squirrell, Ward. Vale: Rawmell (or J Dorrington); Jacques, Owens, Higgin, Hall; Turton, swarbrick; Bradshaw, Powers, Pillow, Rellows, Wallbank, Robinson, Ayrton, Fourie. Replacements: Tagg, Foxcroft, Steele.